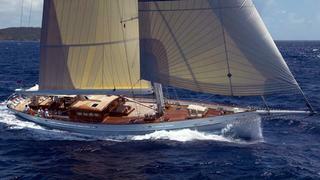 Simultaneously, news arrives from Michael Nethersole at Northrop & Johnson and Toby Walker at Dubois Yachts of a $450,000 price reduction on their joint listing, the 32.3m sailing yacht Carl Linné. Designed by Dykstra Naval Architects and built in 2003 by Holland Jachtbouw to Lloyds class, Carl Linné is a modern interpretation of the fast and seaworthy Bristol Channel Pilot Cutter. Like her forbears, her powerful sail plan is easy to handle with a minimum of crew, and her plumb bow and broad counter stern give her a strong, workmanlike appearance. MCA Large Yacht compliant, Carl Linné accommodates six guests in three staterooms. On display at the Fort Lauderdale show, Carl Linné is now down to $5.25 million.